The Trenton Area Soup Kitchen (TASK) gets four stars on the report card provided by Charity Navigator; it earns 69.13 points out of 70. So Dennis Micai, executive director of TASK, will be able to share that good news at a breakfast at Princeton United Methodist Church (PUMC), Nassau and Vandeventer, on Sunday, January 13 at 8 a.m.
PUMC volunteers have been serving at TASK in Trenton for two decades, but last June the church and TASK began a new partnership to serve meals in Princeton to more than 50 people every Wednesday. 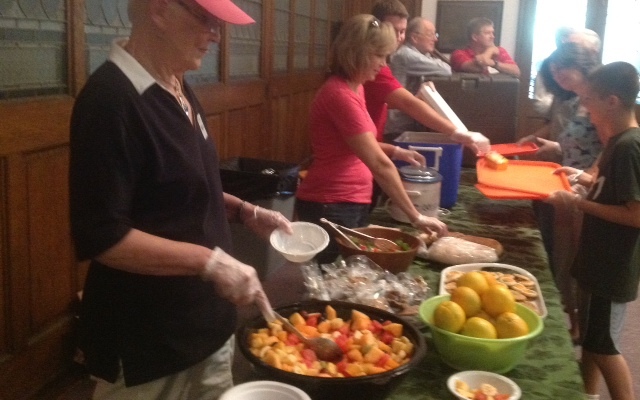 Some come for the food, some for the fellowship, and dozens of volunteers from both the church and the community are helping. TASK cooks most of the meals but outside organizations (the restaurant Zorba’s Brother cooked a turkey dinner last month) have also contributed. TASK has a similar partnership in Hightstown. TASK offers lots of ways to contribute. So although hunger is a growing problem, Micai will have some good news stories to tell. The breakfast is catered by the United Methodist Men, and all are invited. (Reserve at 609-924-2613 or UMM@princetonumc.org). It will be good to hear some good news for 2013.